1940s: Jar of paintbrushes. Man selects paintbrush and touches its bristles. Man dabs paint and mixes color. Man paints mural. 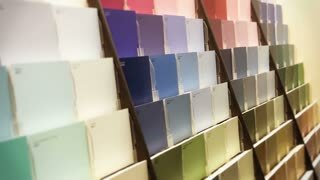 A man selects a paint sample in a big box hardware store. Painter selects the color palette. The artist works with paints. 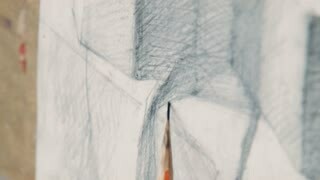 Close-up cup of hot coffee and artistic various paintbrushes with different shape of bristles on work table in art studio with blurry inspired talented female painter drawing preliminary sketch. 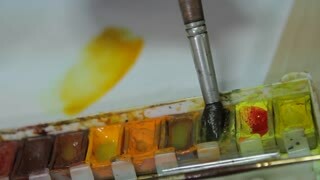 Close-up of various artistic tools: paintbrushes, different shapes of bristle, palette and paints on artist table with blurry female painter creating a painting on easel at art studio in background.